A year ago, the Faculty of Computer Science set an ambitious goal – to double the number of female students entering undergraduate programs in September 2018. It was special goal for Dalhousie’s special year. 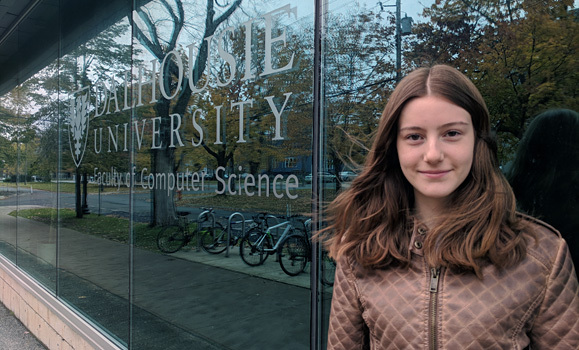 Now Dalhousie’s 2018 class is settled on campus, and the Faculty is reflecting on the progress made: the number of female students entering first-year Computer Science this September is up 144 per cent versus 2016. One of them is Tabea Marzlin, a recipient of one of the newly established Women in Technology Scholarships. “It makes me optimistic to see the acknowledgment of, and positive contribution towards, changing the harsh reality many women in technology currently face,” she says. “We are delighted to have made this progress over the last two years,” Andrew Rau-Chaplin, dean of the Faculty of Computer Science, says the Faculty is delighted by the progress made. Increasing diversity within the classroom has been a priority for the Faculty for many years, with gender at the forefront. When it comes to studying and working in technology related fields, women are still in the minority. Thus, the technology used in day-to-day life is not necessarily reflective of the whole of society — something the Faculty of Computer Science is passionate about changing. “A lack of gender diversity in tech related fields not only affects us, but similar schools in Canada and beyond, and industry,” explains Christian Blouin, associate dean, academic. “It’s also bad for society generally. Technology impacts on everyone, every day. If the creators and influencers behind technology are not diverse, technology cannot truly reflect and serve society. Thirty-two of the female undergraduate students entering computer science programs in September received one of the Faculty’s new Women in Technology Scholarships. Sponsored by both industry and the Faculty, the award not only offers financial support but also mentoring from female tech leaders and enriched co-op opportunities, helping develop this next generation of female technology leaders. Industry partners supporting the Faculty’s efforts and giving their name to scholarships include TD, CGI, MOBIA Technology Innovations, Gogii Games, T4G, and Analyze Re. They’re joined by non-profits Women in Communications and Technology (WCT) and Techsploration as founding partners in this campaign. 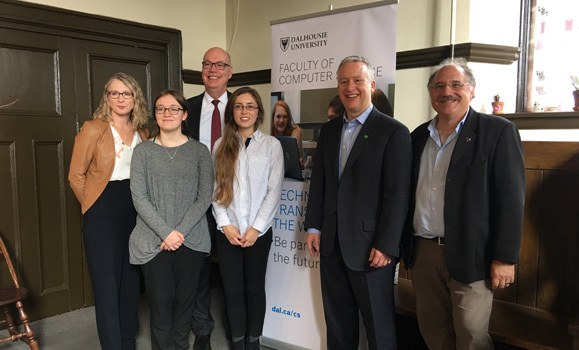 "Working closely with Dalhousie’s Faculty of Computer Science and their WeAreAllCS initiative will help TD hire the best people, foster a work environment where people can be their authentic selves, and give people the power to help drive our transformation,” says Bruce Mitchell, chief information officer for TD Wealth and Insurance. “In the past, our financial business drove our technology development. Now, technology is driving our businesses forward, and the line between the two will disappear altogether. We all need to work to change the persistence of low female representation in Computer Science. At TD, supporting successful women studying or working in STEM fields where they have been traditionally underrepresented is an example of how we can help advance women in leadership roles in the Canadian technology community." For first-year student Tabea, her interest in computer science started at early age through an introduction to programming. But she credits her Women in Technology Scholarship with providing the “flexibility and opportunities” to explore technology as a path for her. Alongside the scholarships awarded to some of this year’s cohort of female students, all first-year female students are benefitting from an enhanced learning and extracurricular experience including a revamped first-year curriculum, peer mentorship, and industry professional development, recruitment and networking opportunities. A key development for first-year female students is the introduction of a peer mentorship program. A collaboration between the Faculty and the Women in Technology Society (WiTS), the program has provided each incoming female student with an experienced student mentor to offer advice and support as they embark on their academic journey. 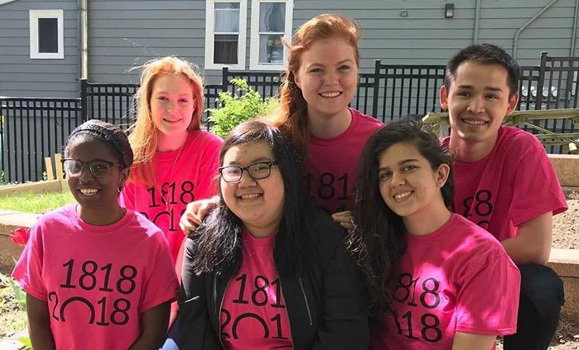 “WiTS wanted to support the mentorship program to provide first years with a direct connection to upper year students and help foster a community where all students feel included,” explains WiTS President Alicia Wong. “Mentors are readily available on- or offline to answer questions, share experiences and just chat about life. In a field with a gender gap it is important for female-identifying students to know that they are part of a strong, supportive community and the mentorship program introduces new students to this as soon as they arrive at Dalhousie." The Faculty may have reached its short-term goal but efforts to build on this momentum do not end there. He hopes the increase in female students will have a “knock-on” effect, sparking an interest for future computer science students that may not have been there before. The Faculty of Computer Science will be offering additional industry-funded Women in Technology Scholarships to students applying to enter undergraduate programs in 2019. A team from the Faculty organized and hosted the 2018 Canadian Celebration of Women in Computing (CAN-CWiC) in Halifax, 2-3. This was the first time this national event has visited the East Coast. The conference welcomed almost 500 students, faculty and industry professionals from across Canada for two inspirational days of keynote speakers, workshops, panel discussions and networking opportunities. Alongside this, the Faculty will welcome 120+ female students from high schools across Nova Scotia to campus for the second annual Women in Tech Day on November 16.